Hungarian lawyer; born at Budapest 1858; educated in his native city and at German universities. In 1884 he became privat-docent in Roman law at Budapest, being appointed assistant professor nine years later, and professor in the following year. In 1895 he was made a member of the editorial committee in charge of the drafting of the Hungarian civil law; and in 1902 he became a privy councilor. 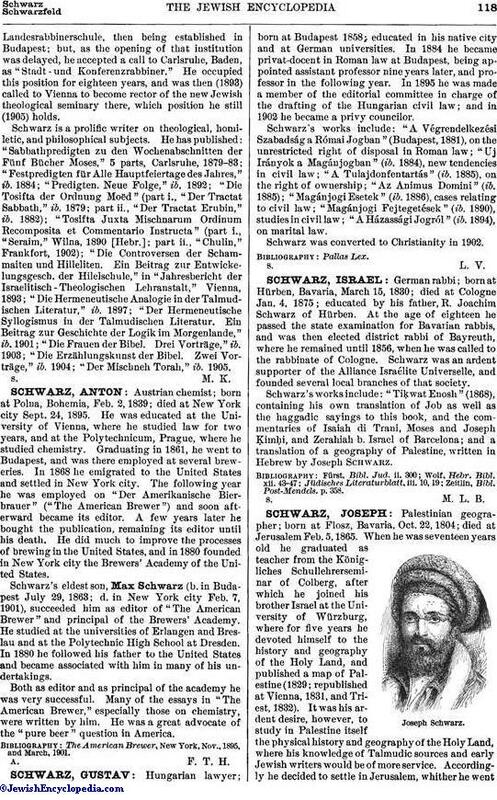 Schwarz's works include: "A Végrendelkezési Szabadság a Római Jogban" (Budapest, 1881), on the unrestricted right of disposal in Roman law; "Uj Irányok a Magánjogban" (ib. 1884), new tendencies in civil law; "A Tulajdonfentartás" (ib. 1885), on the right of ownership; "Az Animus Domini" (ib. 1885); "Magánjogi Esetek" (ib. 1886), cases relating to civil law; "Magánjogi Fejtegetések" (ib. 1890), studies in civil law; "A Házassági Jogról" (ib. 1894), on marital law. Schwarz was converted to Christianity in 1902.